Electric Kettles are perhaps one of the most basic and important electrical appliances you may be using in your home. Whether you are looking for one for your hostel room or your family kitchen, it should be one of the harrowing experience to choose the one that is best suited for your needs. The electric kettle can serve multiple purposes right from brewing coffee to making noodles or even just for boiling water. Let us check out the best electric kettles you can buy in India. 3 How Does an Electric Kettle Work? Before we can move to find the best electric kettles in India, it would be a practical option to check out the factors you need to take care of while buying an electric kettle. We will check out the factors you need to check out. One of the deciding factors in choosing an electric kettle is its boiling speed. Faster the kettle can boil water, the better it will serve its purpose. Ideal performance should be around 3 to 4 minutes for boiling water. It does have a bearing on the time wasted in getting it boiled, and the electricity consumed during the process bears a lot of importance. This is yet another important aspect when we think of electric kettles. The low power consumption would be advisable given the fact that everyone around has been focussing on saving electricity. The auto shut down feature should be another feature you would look ahead to. Well, kitchens these days are turning into masterpieces. The kitchen equipment you choose should be efficient in what they are supposed to, but the aesthetics and looks are one of the important factors. Make sure that the kettle design goes well enough with your kitchen décor. Of course, it may not be an essential factor from a performance point of view but plays a major role in enhancing the appearance of your kitchen and dining table. Ease of use is yet another feature we would be looking out to. Of course, you have been using the regular kettles will indeed mean you are experienced enough with it, but the use of electricity makes them to be taken care of. Ensure that you understand the multiple features that the kettle is supposed to work with. A good cord length is one of the features that focus on the usability. We would also prefer kettles with detachable cord. Indian families are normally larger enough. In many cases, there is a minimum of five members in each household. From that perspective, it may be a good idea to go with an electric kettle that meets your exact requirements. When we discuss the size of an electric kettle, the most important aspect you need to take care of would be the capacity and the space it needs to store. 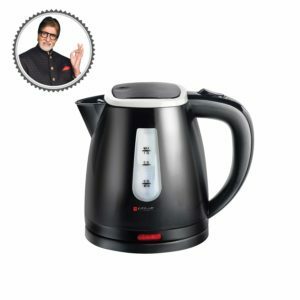 Having gone through those buying tips for the electric kettles and the features thereof, let us now review the best electric kettles that you can buy in India. 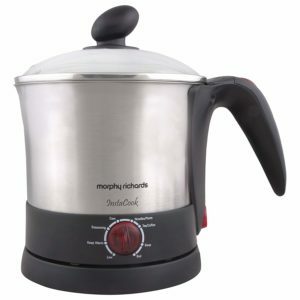 The Morphy Richards InstaCook 1200-Watt Electric Kettle has a one-litre capacity and offers you multiple and versatile applications that include cooking Maggi. The looks and the grips complement the functionality even better. The electric kettle has a capacity of one litre and consumes 1200 Watts of power. It heats up the contents rather quickly enough and helps you out in boiling your products in just under two minutes. You have a completely concealed body and thus should be really easy to use and clean. The cordless connectivity is yet another added advantage that makes it a great choice to go with. Two years of warranty should make it a formidable choice for most of you. You have access to the variable control knob. A transparent lid is an added advantage. The looks of the kettle improve the aesthetics of your kitchen further. It can be used to cook Noodles, soups, and beverages like tea, and coffee. Auto cut off may not work efficiently at times. Can produce a little noise at times. Q: Can it boil or sauté vegetables? A: Yes, it can help you boil or sauté vegetables and let you perform a host of other tasks. Q: Is this kettle portable? A: It is of standard size, but it would not be feasible to carry it regularly while travelling. 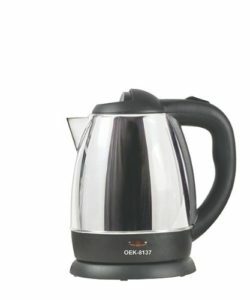 The Orpat OEK-8137 1350-Watt Cordless Kettle is a great choice and offers you excellent functionality for most of your needs in cooking any sort of cooking you may be looking for. Orpat is one of the prominent brands in India, and this electric kettle brings in a host of features to you. One of the most efficient cordless kettles, it is made from stainless steel and aluminium combination. This should ensure a longer life and a durable performance. The kettle consumes 1350 Watts of power and thus will help you boil water in just around two minutes. The locking lid should make it one of the best options for avoiding spillage. One of the best electric kettles to boil milk, you also have a one year warranty on the product. In spite of offering you excellent features, it offers you an affordable price of just under INR 1000. The handle has an ergonomic design that helps you work with it without many hassles. Auto shut off to save the product and electricity. 2 liter capacity that should be sufficient for most of your needs. detachable improves cleaning and portability. The cord is a little shorter and may cause issues. It is a bit noisy when it is operated at high speed. Q: How much time will it take to boil eggs? A: It should take around five minutes. Q: Does it have dry boil protection? A: No, there is no dry boil protection. Cello Stainless Steel 600B Electric Kettle is available with a one litre capacity and black/silver color combination. The electric kettle can be one of the best options for boiling water, making tea or soups or cooking noodles. The wider mouth of the kettle should make it an easy option to clean thoroughly. The kettle consumes 1200 watts of power. 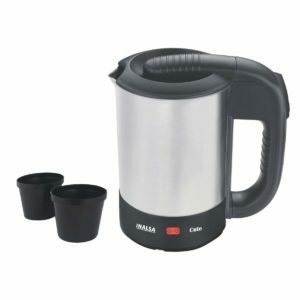 The kettle can boil water in around two minutes and thus can be an excellent option for your urgent needs. You also have access to a concealed heating element in tune with most of the options in the electric kettles currently available. It offers you a cordless option with the detachable cord for easy maintenance. The stylish look is what should make it a great choice for improving your kitchen décor. The electric kettle provides you the auto cut off functionality for an enhanced protection. The cord length is less than 1m. Q: Can we remove the kettle lid? A: No, the lid is attached to the kettle. Q: What is the warranty provided on the product? A: One year on-site warranty. 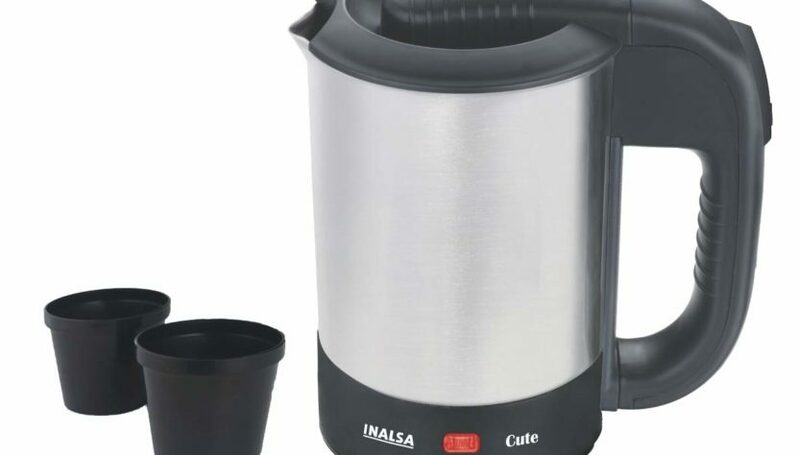 The Inalsa Cute 0.5-Litre Electric Travel Kettle is one of the best options for boiling water or making tea, but for a bachelor or someone living alone. The half-litre capacity of the electric kettle should make it one of the prominent options for limited requirements. The electric kettle consumes 1000 Watts of power. It offers you a Stainless Steel Inox Finish Body for an easy heating and also doubles up as the best addition in improving your kitchen décor with its excellent looks. You have access to auto cut off feature along with the boil dry protection feature enabled. It also comes with an indicator light for letting you know when it is left unattended. The larger lid opening should let you help you clean it efficiently. The cool touch handle ensures that you will be able to handle it without any chances of burning your fingers. Concealed heating element lets you handle it in an easier manner. An excellent option for travel. The cord is a little short. Would have been better with cordless functionality. Q: Does it have three pin plug or two pin plug? A: It has a three pin plug. Q: Does it come with cups? A: Yes, it comes with two cups included with the package. 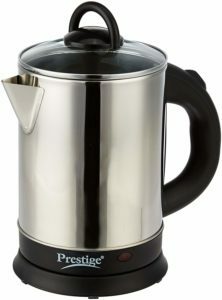 The Prestige PKGSS 1.7L 1500W Electric Kettle lets you prepare hot water and tea in just under a few minutes. The kettle comes with a 1.7 litre capacity making it one of the prominent options for a larger family. The kettle has a stainless steel body that provides you an efficient heating performance. The kettle has a power requirement of 1500 Watts that is quite ideal for an efficient functionality. You also have access to an automatic cut off option to save energy. The power indicator lets you know exactly when the kettle is on or off. This can help you check out if it is powered on as using the kettle without the content can damage it. The 360 degree swivel power base that helps you connect your cord to any direction. No twisted cord. The single touch locking of the lid ensures a faster locking. The heating element is concealed, and this will help you clean your kettle easily. The buttons need to press a little hard. Auto cut off feature may not work properly sometimes, so boiling milk might spill over. A: The cord measures one meter. Q: Can it be used for traveling? A: Yes, it is best suited for travel needs. Well, it is exactly same as how your regular kettle works. The kettles are based on the boiling temperature of the liquid. While the regular kettle receives the heat required from the flame through a gas stove or other forms of fire energy, the electric kettle gets it through electricity. The kettle has a heating element that gradually heats as the electrical energy is converted into heat energy. Ideally, most of the electric kettles use the heating coil to increase the temperature of the liquid. It is exactly same as the immersion heaters you may have used for boiling water for the bath or other similar purposes. In case of an electric kettle, the heating coil is normally concealed. This is done to avoid electric shock and easy cleaning functionality. It also comes with an auto shut off feature that shuts off the power supply to the heating coil when the boiling temperature is reached. Most of the electric kettles offer the auto shut off feature as a means of security against fire hazards due to overheating. Well, those were a few options you would love when it comes to the electric kettles. The kettles we have listed is based on the functionality with no attention paid to the price or discount offers available on the products. We have focussed on the quality of the products and assume that the list of products listed here does meet most of your needs. Have you used any of the electric kettles outlined here? Do share your thoughts and experiences with any of the above listed kettles and do let us know what you think about them. Thumbs up for the great article!! If you are in a hurry and a busy college student. These kettle comes in so handy. During exams and all, when we have to study late nights. Maggi is the option and kettle is the way to get that. This is the concise and comprehensive article. Great content for the kettle.